Take a deep breath — you’ve done it. You bought (or are planning to buy) your first home. It can be a long, grueling, and expensive process, but once it’s over? You’re a first-time homeowner. It’s a good feeling, right? Once you own your own home, you can go all Chip and Joanna Gaines on your house to truly make it yours. Throw a little shiplap here and there, reorient the fireplace, build a hella cool loft — it’s your own house, do what you want! Life insurance for first-time home buyers isn’t as glamorous as beautiful hardwood floors or an inground pool. It is, however, something you should think about when you take out that mortgage. Why Do New Homeowners Need Life Insurance? For the foreseeable future, you and your partner are responsible for making hefty and timely mortgage payments. But hey, you planned for that, so no biggie. But what if one of you were to pass away? Your surviving spouse (and any kids that have come into the mix) will be left with the mortgage payment, car and student loan debt, utility costs, and other bills. Though your mortgage servicer and utility providers may express their condolences, their primary concern is receiving payments on time — even if your family has been struck by tragedy. In fact, even if half (or more) of your family income dissipates after you’ve passed, family expenses only decrease by about 20 to 25 percent. 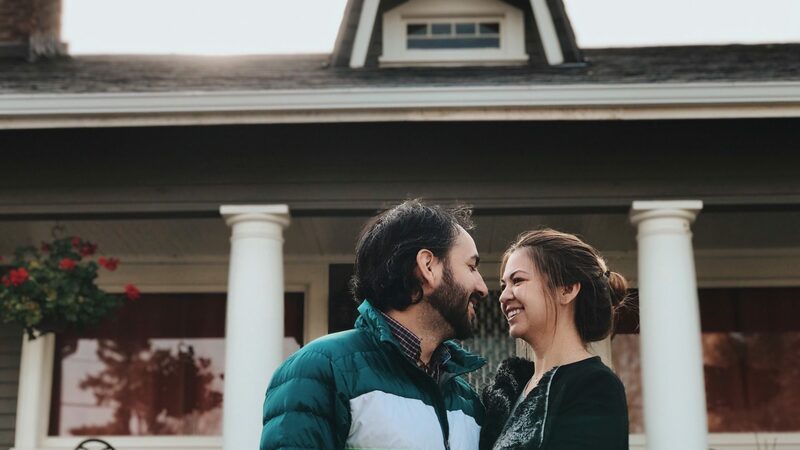 Let’s face it: Becoming a first-time home buyer is proof enough that adulting is rewarding but difficult. All of that effort (and your family’s financial integrity) needs to be protected. Life insurance can help accomplish that goal. Life insurance for first-time home buyers is often provided through one of two avenues: term life insurance and mortgage protection insurance. Mortgage protection insurance, or MPI, is insurance that’s often sold during the mortgage-buying process. Where term life insurance benefits can be used for anything (including paying off your mortgage), mortgage protection insurance is specifically intended to pay off your mortgage if you pass away. In many cases, mortgage protection insurance may also take over loan payments if you lose your job or become disabled. Benefit is paid to mortgage lender, not a beneficiary of your choice. This means your loved ones won’t receive any of the death benefit. Term life insurance is pure life insurance — there’s no fancy bells and whistles, so it’s easy to understand exactly what you’re buying. It’s also pretty affordable, which is nice to hear after you’ve dropped a chunky downpayment on a house, right? If you were to pass away while owing a significant amount of mortgage debt, a term policy could provide more than enough cash to pay it all off. The entire point of term life insurance is to provide you and your family with a soft landing during the time of your life when you’re most financially vulnerable, like right after you take out a mortgage for a home. Should I Buy Life Insurance From My Mortgage Lender? You can’t really argue about the necessity of life insurance for first-time home buyers. Unless you sleep on a literal bed of money, it’s common sense to have some form of life insurance to help protect your family. But should you apply for term life insurance on your own volition or sign up for mortgage protection insurance when taking out your mortgage? Like with most life insurance advice, there’s no one yes-or-no answer. At first glance, mortgage protection insurance looks promising. Simply buy a policy, pay your monthly premium, and boom, your mortgage is taken care of if you pass away before it’s paid off. But what if you’ve had some time to pay down your mortgage on your own before you pass away? Even over a period of 10 years, raises and promotions at work and careful investments could have increased your income substantially. When you die, you may leave your family with much less mortgage debt than when you first bought your home. In that case, the benefit of mortgage protection insurance kind of defeats its purpose. It’ll pay off your mortgage balance, sure, but if your mortgage is only half of what it was when you first bought your house… well, the benefit of MPI seems diminished. On the flip side, if you had taken out a term life policy with a substantial death benefit, your family can use that money for more than just paying off your mortgage. It’s a way of continuing to take care of your family when you’re no longer around to directly contribute yourself. How? Well, your spouse can use the benefits of a term policy to pay off your mortgage, and then use any of the remaining death benefit to establish a college fund for your children, pay off other debt, or take some time off of work to grieve in peace. In short, mortgage protection insurance does what it says on the tin — it pays off your mortgage. But with proper planning, term life insurance can do the same and so much more. American households carry a debt of $137,063 on average, according to USA Today. The vast majority of that debt is mortgage loans, but credit cards, student loans, car payments, and other expenses all contribute. Before making a decision between mortgage protection and term life insurance, calculate how much life insurance your family needs. If you’re a first-time home buyer, it’s likely that your “adult” life is just getting started. Promotions, new cars, and kids are all things you can look forward to or are still celebrating. The point is: Your finances are still in flux. You’ll be paying down your debt, increasing your savings, and accumulating assets. Your insurance needs now aren’t the same as they will be 10, 15, or 30 years down the road. The decisions you make now, though, have long-lasting effects. Even though insurance isn’t as exciting as a new home, it’s still a major and important purchase. Before deciding on mortgage protection or term life insurance, shop around and compare various offerings. With Bestow, you can apply for term life insurance that matches the amount of your mortgage — and can cost less than $10 a month! Applying for a policy takes less time than it does to sign your closing papers, too. Oh yeah! You’ve worked hard to buy your first house. Help protect your family by choosing the right life insurance for you, so they can continue to enjoy all of your hard work even if you’re no longer around. Daniel Mattia is a freelance writer and blogger who specializes in writing data-driven evergreen content for startups and small businesses. He resides on the east coast with his cat, Rocky, and enjoys working on his personal fiction projects, gaming, or reading when not writing for clients. Daniel can be contacted and hired at http://danmattia.com.